Every firm needs to invest time in converting their detail library from legacy CAD format into smart, editable Revit details. This is NOT a ‘push the EASY button’ process, but there are different methods with different (in value and future useability) results. Let your project’s budget and scheduling timeline guide your (immediate) decision process (but vow to ‘clean it up’ later!). Background: I recommend firms to set up a STANDARD DETAILS resource file (.rvt). 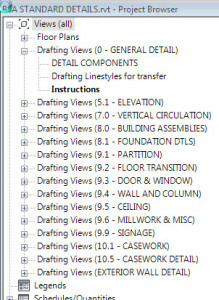 Whereas CAD details are typically individual files in a library folder on the network, Revit details are Drafting Views in a project environment. Create Drafting View types to organize details, and implement naming standards. I use the desired sheet sequence as part of the naming convention, which makes it much easier to locate details from the resource file when transferring into projects (I remove the sheet number from the Title Used on Sheet). 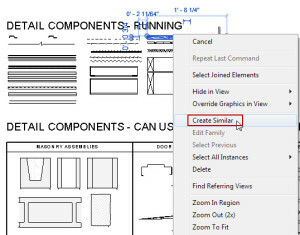 Open the CAD detail in Autocad adjacent Revit. Work in 2 Revit environments at the same time: the [FIRM] Standard Details.rvt file (located in the [FIRM] Content library in [FIRM] Templates folder) and a new Detail Component .rfa file. b) Identify elements in the CAD detail that would be beneficial as a whole assembly – ie: sink section, etc. Isolate those lines and WBLOCK it to your desktop or other temporary space. This helps to reduce the amount of linework/style ‘clutter’ that working with the entire CAD detail brings in. d) Save the Detail Component to the [FIRM] Library, [FIRM] Detail Components folder. Use intelligent naming, please. Also load into the [FIRM] Standard Details.rvt, and place in both the (visual library) DETAIL COMPONENTS view the new (detail) drafting view. BONUS: Not only does this convert the current detail, but becomes the resource for quickly creating new fully Revit details in the future. e) Add standard detail elements (gypbd, metal studs, blocking, etc) from detail components found in the DETAIL COMPONENTS view (see browser). THIS SAVES A TON OF TIME. You can visually select what you need, then quickly RC > Create Similar, then go back to your detail and immediate place the desired element. No need to learn the precise name of all these very frequently used components – just look, select, Create Similar, and start detailing! f) Once detail components are in place, MOVE the CAD background off to the side. Then dimension to match the original detail (moving the CAD ensures you don’t dimension to CAD lines, which would then disappear once the CAD is removed). g) UNLOAD the CAD detail. Just deleting it from the view may keep confusing reference to it showing up in the Manage Links panel. POOR DETAILING METHOD – Direct Use of CAD Details. a) Create a new drafting view in your project file. Link in the desired CAD detail. c) Select the CAD file, use QUERY, and select the layers for the CAD text leaders/dimensions and Hide In View. d) Accept that your detail cannot be modified or effectively edited, that linestyles and weights will not match other Revit details. Also, the project file archive risks broken links and lost relationship to any/all CAD based details. e) Vow to come back after the project deadline and rework the detail using the best practice method listed above. This entry was posted in BIM/Revit and tagged Annotations, BestPractice, Details, DocumentationWorkflow, Implementation, ProjectManagement. Bookmark the permalink. Thank you for your whole labor on this web site. You offer very useful tactics through your website and as well welcome participation from other ones on that point.